Little girls love to wear crowns and designing their own jeweled tiara is a fun activity for parties, rainy days and dress up games. 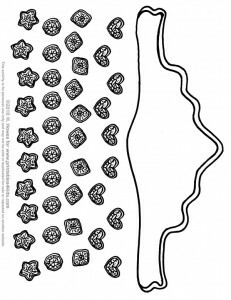 Print our princess tiara craft pattern out on card stock, construction paper or transfer onto heavy felt, cut and attach a ribbon to the back to make the tiara adjustable. Color all the jewels and add some glitter, too, if you want, then cut them out and attach to the tiara. Click on the image above to view and print the tiara full size or download a slightly larger version as a PDF file.